JFK took command of PT 59. He chose Lt. (jg) Robert Lee Rhoads, Jr. for his executive officer. Five of the men who had served with Kennedy on PT 109 (Maguire, Mauer, Kowal, Drewitch, and Drawdy) were available for reassignment and chose to join Kennedy in his new command. The log books of the boat’s activities for the month of September have been lost. 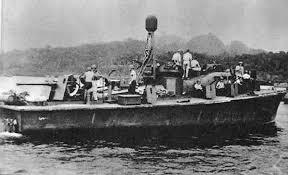 However, boat chief Christiansen recalled years later that the first days after JFK took command were spent in converting the PT boat to a gunboat. After taking her over to Guadalcanal to moor alongside the repair ship. The crew ripped out her torpedo tubes and mounted a 40 mm cannon on the bow and stern. Three batteries of .50 caliber machine guns were bolted to both the port and starboard. Lastly, the crew retrofitted the cockpit with .30 caliber machine guns on each side of the cockpit. To protect the crew during the hoped for engagement at close quarters with enemy barges, armour plates were installed for the gunners. However, when JFK, Lennie Thom and Dusty Rhoads tested the thickest armour that would still allow the boat to handle well, the trio fired .50 caliber rounds at it, which left it riddled with bullet holes. Nonetheless, the useless armour was bolted into place. Kennedy and crew commuted back and forth from Tulagi to Guadalcanal most days to work in the hot sun, occasionally sleeping on the repair ship when their work hours ran late.